PTV Group has become a new member of the Future Logistics Living Lab Australia at NICTA. An innovation platform for the Australian logistics industry, the Living Lab is an interactive demonstration space for cutting-edge technologies and a living community of industry, research and government experts working together to find innovative solutions to operational challenges facing the Australian logistics industry. The Future Logistics Living Lab also provides a productive platform to develop, test and demonstrate new technologies. PTV Group’s participation in the Lab clearly demonstrates the company’s commitment to supporting research into future-oriented logistic solutions. Joost Bekker, Business Development Director at PTV Asia Pacific explains that PTV Group can bring tangible experience and innovative technology to support the lab in developing new solutions. The Lab’s primary objective is to develop innovative solutions for the Australian logistics industry, bringing more efficiency, safety and environmental benefits to logistics transport chains. Special emphasis is placed on aspects such as rising fuel costs, high levels of congestion, reduction of emissions and improvement of traffic safety. PTV Group offers solutions for the traffic, mobility and logistics industries. The PTV Concepts & Solutions division unites experts from the transport and logistics industry, transportation planning, development planning, economics, information technology and project management. PTV Group’s technological know-how from the transportation planning industry and traffic technology, and broad experience with logistic technologies will be their key inputs into the Lab. In terms of logistics, the PTV xServers are particularly useful as they suit the development of new innovative solutions. According to Leader of the Lab Neil Temperley, the Lab supports different industries in becoming more efficient and productive, and in sustainably reducing the costs with reference to the emission of exhaust gases. He adds that a strong community of active participants is the key to the lab addressing these challenges, testing new ideas and implementing change. The size of the laboratory enables low-cost development of really new ideas and prototypes in a low-risk environment. 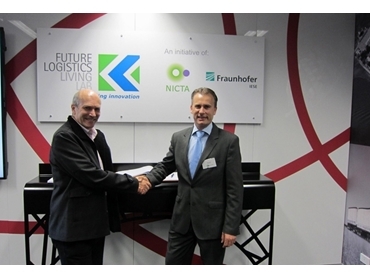 The Future Logistics Living Lab in Sydney, Australia was established by NICTA in collaboration with Fraunhofer Institute for Experimental Software Engineering and SAP AG. Set up at NICTA’s premises in the Australian Technology Park in Sydney, the Living Lab features an exhibition, event and workspace, with futuristic demonstrations showcasing technologies created and tested by participants of the Lab. The Lab is also a member of the European Network of Living Labs (ENoLL).